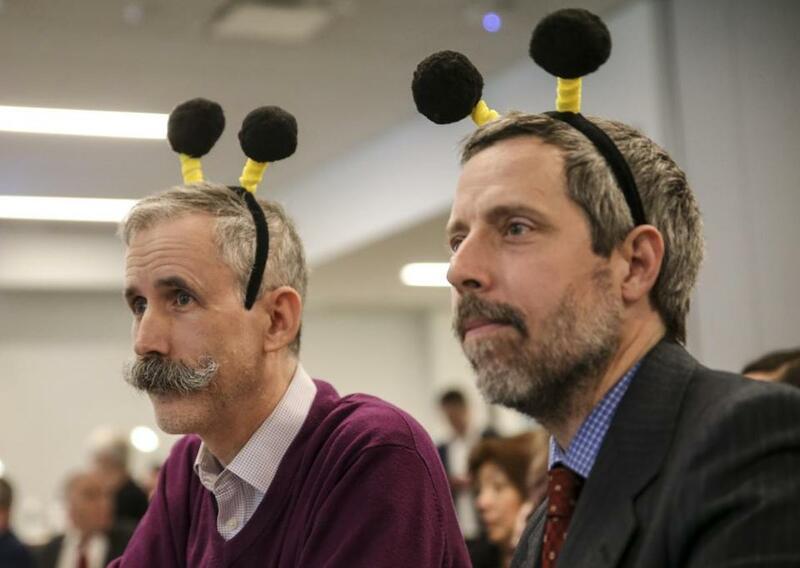 Judges Will Johnston (left) and Peter Chipman got in the spirit of Thursday’s corporate spelling bee. Even if you’ve been to a lot of spelling bees, you probably haven’t been to one where the dress code was business casual and the contestants drank beer. Don’t worry, those contestants were adults, employees from some prominent Boston businesses. They were participating in a fund-raiser for First Literacy, a Boston-based organization that supports educational programs for low-literacy adults or those who speak English as a second language. The event, held Thursday evening at State Street’s Channel Center in South Boston, was the 30th annual spelling bee run by the organization, which was formerly called the Boston Adult Literacy Fund. Thirty-six teams of three competed, divided into groups of six teams called swarms. Members of each swarm were asked to spell out word after word on small whiteboards. They could confer with one another before settling on what they thought was the correct spelling, and each team was allowed one misspelling. Prior to the competition, contestants described strategies they hoped would give them an advantage. “We just went through the worst words and quizzed each other,” said Owen Foley, an investment platform analyst with John Hancock. Emily Stanford from the United Way of Massachusetts Bay and Merrimack Valley, said her group planned a more physical approach. “We do 10 push ups, we hold a plank, and we’ll shout out words to each other,” she said. Stanford said her team fumbled “chauffeur” last year, but this time it had a ringer: Jackson Miller, who in the sixth grade won a statewide spelling bee in Vermont. Miller, however, admitted to having some doubts. Once each swarm was down to one team, the finalists competed to crown a champion. While it was easy to get lost in the relaxed atmosphere and good-natured competition, participants were also reminded of the real reason they were there. During a ceremony before the bee, the group honored Raymond L. Flynn, former Boston mayor and US ambassador to the Vatican, who was instrumental to the group’s formation. Correction: An earlier version of this story misspelled Skye Kramer’s name.